People flock to Zermatt from all over the world for a view of the Matterhorn. They line up on the bridge in town, the perfect vantage for a selfie with the classic Toblerone shaped mountain. The unmistakable icon of the Swiss Alps. Often, it hides in the clouds, and plenty leave having never seen the pointed summit. My first time in Zermatt was like this. We ran into town after finishing the Glacier Haute Route. By the time we looped toward Zermatt, it was buried behind low, thick cloud. "Look! There's the Matterhorn!" Dan found pleasure in exclaiming and pointing towards lower, non-Matterhorn shaped peaks. And I fell for it more times than I should admit. Not this time. Back in Zermatt just two weeks later, we ran this tour. With blue sky and sunshine we didn't stop staring at the perfect pointed peak during two long days of running. From the busy Zermatt train station, the terrain shifts from town bustle to forest silence, then higher to some of the smoothest singletrack in the Alps. This big loop above Zermatt reveals all the surrounding drama, including the Matterhorn, from many different angles. Hotel Schwarzsee is the overnight location- views don't get much better than from the patio there. 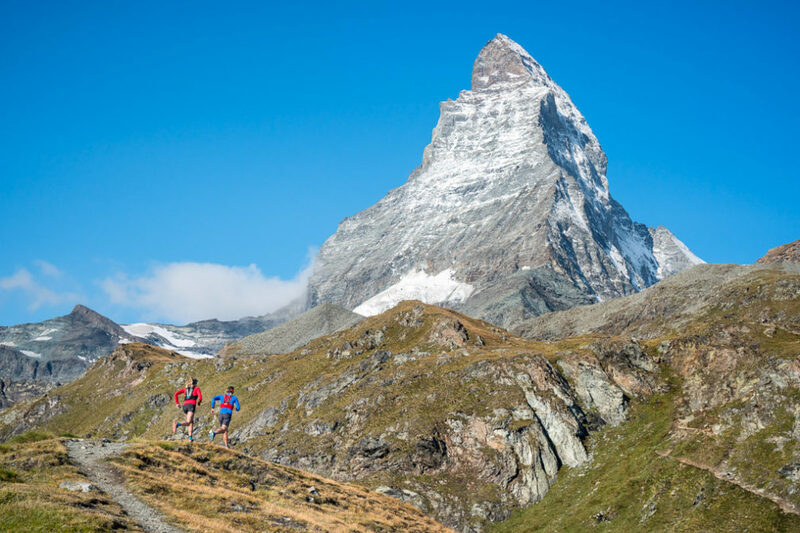 Smooth, high running always in view of the Matterhorn, and a comfortable hotel right on the route...what more could you want from 2-day tour? There are lots of ways to adjust this two day tour. Split the loop if limited to one day, or short-cut your climbs by using the trains and lifts to Gornergrat, Furi, or Schwarzsee. Run more with a side trip up the Mettelhorn. An out and back to the Mettelhorn (3406M) adds 9.5 km, 1059m+ and a small glacier crossing. The sharp summit is worth the effort for its high perspective across the valley and high-up-there feeling. For more photos and other runs like this, visit our Elevation Zermatt 2 Day Page. FOR FULL INFO, THIS RUN IS FEATURED IN OUR GUIDEBOOK, RUN THE ALPS SWITZERLAND: 30 MUST-DO TRAIL RUNS. TIP: Stop at the Trift Hotel for homemade iced tea made with lemon, orange juice and sugar, and an apple torte fresh from the oven.